A week ago, Quidd digital trading card and sticker app was suddenly updated with new and official content from Hasbro‘s Evergreen branding. A week later, both companies announced their official partnership with new content from Hasbro’s Transformers, My Little Pony, Magic: The Gathering and Monopoly franchises. But the best part from the announcement is the fact that the companies confirmed G. I. Joe related content in near future. Possible concept art and final designs for upcoming G. I. Joe related entertainment content. You can check out the two press releases (one business related and the other geared towards the fans), after the jump. You can download the app via Quidd’s official website. 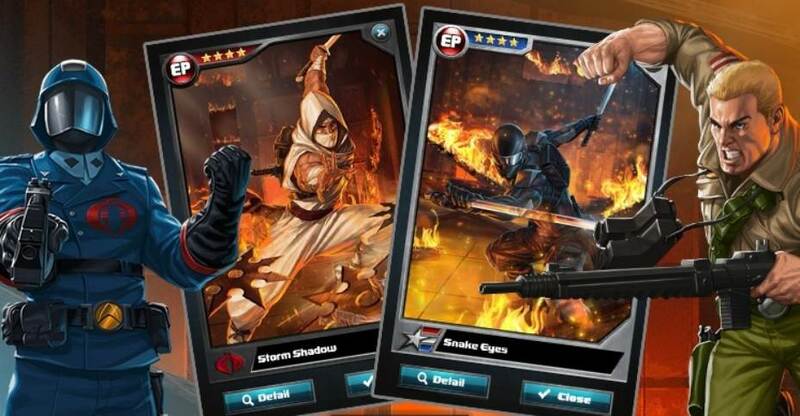 News Post image: G. I. Joe Battlegrounds mobile app. NEW YORK, May 30, 2018 /PRNewswire/ — Hasbro, Inc. (NASDAQ: HAS) the leading global play and entertainment company has teamed with Quidd, Inc., a rare digital goods marketplace to create, distribute and sell digital stickers, trading cards and digital toys through Quidd’s application, available on iOS and Android devices. Founded in 2015, Quidd is the leading platform for buying, trading and using premium, rare digital goods and is one of the few destinations that introduces scarcity and serendipity into the digital retail experience. Quidd can now make characters from Hasbro’s catalog, such as OPTIMUS PRIME, RAINBOW DASH, or DEMOGORGON, rare and fun to collect digitally. Quidd has sold nearly 1.75 Billion individually serialized items since launch, making Quidd’s digital goods ledger and catalog the largest on the planet. The TRANSFORMERS, MY LITTLE PONY, MAGIC: THE GATHERING and MONOPOLY first edition releases are now available via the Quidd App. You may have noticed something changed when you entered Quidd last week, or maybe you felt it in the UI. There’s good reason: this is part of Quidd’s biggest launch EVER with 4 new channels from Hasbro already — Transformers, My Little Pony, Magic: The Gathering, and Monopoly. But don’t think this is just a flash in the pan — because the channels from this and last week are just a taste of what this partnership means for Quidd, Hasbro, and digital collecting as we know it. In the coming months, we’re going to be bringing a significant number of amazing fandoms in our partnership with Hasbro, working with our world-class design team to help some of the most iconic characters come alive for a whole new collectible audience. Expect digital exclusives and collector edition items from the likes of GI Joe, Dungeons and Dragons, and more that will broaden the number of offline fanbases that can experience these iconic brands in a new online way. Quidd began as a way to show that digital goods and collections can be just as engaging and meaningful as the physical counterparts and fandoms around them. We began with just a couple of content partners, and did our best to prove that fans would follow. Whether it’s sports, lifestyle, movies or anime, we surely started to grow, with Quidd becoming a home to anything and everything along the way. Now, nearly 100 channels and over a billion Quidds later, we’re just getting started. Hasbro (NASDAQ: HAS) is a global play and entertainment company committed to Creating the World’s Best Play Experiences. From toys and games to television, movies, digital gaming and consumer products, Hasbro offers a variety of ways for audiences to experience its iconic brands, including NERF, MY LITTLE PONY, TRANSFORMERS, PLAY-DOH, MONOPOLY, BABY ALIVE and MAGIC: THE GATHERING, as well as premier partner brands. Through its entertainment labels, Allspark Pictures and Allspark Animation, the Company is building its brands globally through great storytelling and content on all screens. Hasbro is committed to making the world a better place for children and their families through corporate social responsibility and philanthropy. Hasbro ranked No. 1 on the 2017 100 Best Corporate Citizens list by CR Magazine, and has been named one of the World’s Most Ethical Companies® by Ethisphere Institute for the past seven years. Learn more at www.hasbro.com, and follow us on Twitter (@Hasbro & @HasbroNews and Instagram (@Hasbro). With 3D vehicle models coming out can I FINALLY? get 1"64 scale GIJOE Hot Wheels based on the actual designs. Unlike the Maisto line? If they sell the trading cards in physical form that would be nice also. Digital cards? Digital Toys? Digital stickers? People actually pay money for this type of stuff? I guess there is a sucker born every minute. Actually, the cards are pretty much free. Items are digitally blindbagged with a fixed probability when "buying" them. You "buy" them with in-game coins and you are given 4000 coins every 3 hours if you log in periodically every 3 hours. The next three hours doesn't start until we end the current 3 hours. If we don't log in for more than 6 hours, the game will still give you 6500 coins (instead of 8000 coins as you would have gotten if you logged in 2 times) as an incentive when you do log in next time. The incentive is given at a certain rate on 3 hour multiples. Stickers cost 1000 per blindbag which has about 3 random stickers. Trading Cards are 1500 per blindbag which has about 3 random cards or just 1 random card. 3D Models are the most expensive with 10000 coins per random figure. Some items are rare but you can always trade them with others. You can request the item you want in exchange for an item which you have multiples of. So, you will now understand that we do not have to pay a single cent if we don't want to. But, if you really want to try your luck at a blindbag opening frenzy, you can save up all your coins and blow them off in one go. You always have an option to get 160,000 in-game coins (120 hours of logins) for $9.99. But if you are lucky, the game will have random 3X offers which will give you 480,000 coins. Thanks for clarifying. They should probably stress this in their press releases as opposed to saying these things are for purchase. Still not my cup of tea, but glad to see that it is not as dumb as it initially appeared in the press release, and I hope all who are into this sort of thing enjoy it. It's a good thing I don't live in a glass house. My pleasure. I think they do have a point when they said purchase. There is an option to do that too but it's not really straight forward. Evergreen Vehicle Mode Set etc. Each set above has about 20 items each. It's time consuming to collect them all when they are given out 3 each randomly. To get to my last card on one set I had to open about 15 Blindbags just for that. But, all 20 items can be purchased with real money. For 4.99 you can buy a pouch with all 20 items in it. But these pouches aren't always available. They are available randomly from time to time on the Offers section. I am yet to see a pouch I want. I've paid in on something similar to that before. imho, it's generally not as cool or flexible as having the physical product in hand. But that may be a generational thing. Access to the cards isn't at the mercy of the Internet being online, the company selling them still existing, their authentication server staying online, an end-of-life product strategy, or even your electricity being up and running. Access to the cards can never be impacted by a change in licensing or held hostage for a new fee, a subscription model that bleeds you over time, or any other payment mechanism beyond the initial purchase price. Even if the digital cards are accessible from a smartphone, physical cards are always more available in general, for example when you don't have a cell signal or don't want to turn on your phone. Related to the previous one, in some ways they travel better. A little case with cards in it is available even when cellphone use is restricted, such as when your flight is taking off or landing, or on road trips outside of cell reception range. If the cards are used in an actual card game, there's a fun factor related to actually laying them out on a table and physically interacting with them. Viewing them is limited to the size and resolution of the screen on the device you're using to access them. This could be good when it's a large, high-res desktop monitor if the product is designed with high res artwork. This can be bad when you're trying to view them on a handheld device. With physical cards they're always viewable, however as eyes age, sometimes it's nicer to view high res artwork on a large screen vs a small card in the hand. Risk of loss through theft or disaster (flood, fire, etc). If the cards are used in an actual card game, you need physical space to play the game and there are limits to the special effects that can be displayed vs a digital representation (think physical Magic: The Gathering vs a digital CCG like Hearthstone). Is the previous art from Battlegrounds being recycled into this game or is it new art?